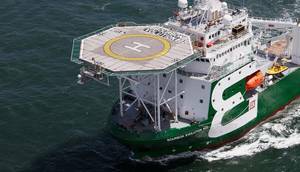 French offshore services provider Bourbon Corporation announced the resignation of Astrid de Bréon from her position as Chief Financial Officer from July 11. Since her arrival on the 1st of February, 2017, Astrid de Bréon has largely contributed to Bourbon's transformation and to the sustainable reorganization of the company's financial debt. She will continue with her duties till her replacement and departure from the company. In another press release, Bourbon said that it has reached an agreement with the majority of its creditors to withhold payment of its loans and servicing of its debt. A press release from the company said: "Bourbon announces having signed a general waiver with its leasers and debt holders representing the majority of its debt, thus allowing the group to withhold the payments of its loans and the servicing of its debt." It added that aimed at protecting the group, this waiver allows it to stay focused on its operational priorities and on the implementation of its #BOURBONINMOTION strategic plan. However, it did not disclose the total value of the agreement, but as of the end of 2017, Bourbon had total borrowings and financial liabilities of about $1.9 billion. It further said that the company remains confident in its ability to find before year end a balanced solution with all its lenders - often long-standing partners - that suits all parties and allows the company to adapt its financing to its future development.